Using social media for marketing is hardly a new concept at this point, but innovative businesses are always finding new ways to make the most of the medium. 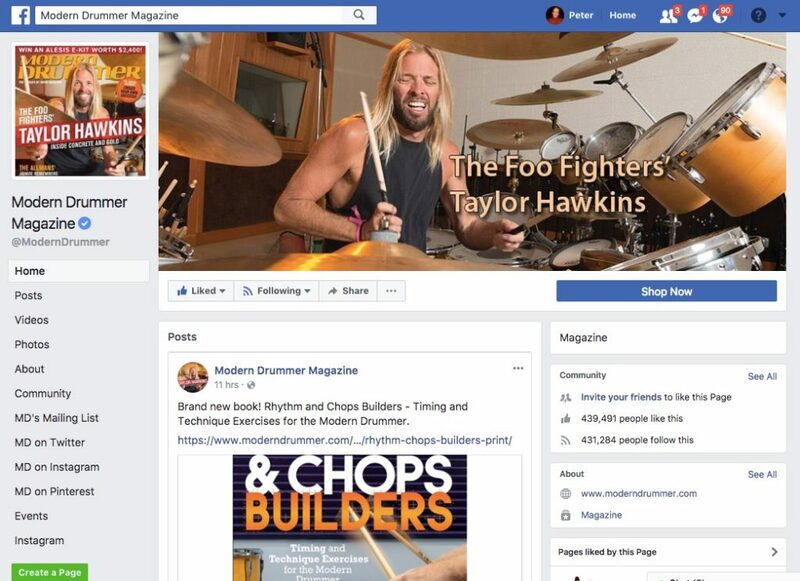 Modern Drummer Magazine, in particular, has found a way to exploit Facebook in a way that works incredibly well as an issue-based publication. The most common use of Facebook as a marketing tool is to create and optimize a profile for the business and then use the standard feed to push articles, posts, and announcements to existing friends. Some companies might get a little more creative and try adding their content to the general melee of Facebook Instant Articles (but that’s another discussion). Modern Drummer, a long-standing print-and-digital publication, has gone a step farther. Modern Drummer puts out regular (web based) issues chock full of news, interviews, and instructive articles. And every time they put out a new issue, they update their Facebook page to reflect that issue. They update the profile images accordingly and post links and blurbs to each featured article. With a hard paywall, this would still only serve as an alert to pre-existing subscribers that a new edition was available. But, thanks to their use of IssueM and Leaky Paywall, each article can be shared up to 1000’s times. Visitors to the page can read a few articles in their entirety before being prompted to subscribe. In other words, Modern Drummer has found a way to use their Facebook page as a phenomenal, interactive teaser to each magazine issue. This method has actually proved to be amazingly successful as a marketing tool for Modern Drummer. Thanks to their creative use of Facebook, a significant chunk of the traffic to their website – 26% – comes from social media. That’s second only to organic search. Essentially, Modern Drummer has discovered how to leverage web based issue publishing and their metered paywall, to create a turbo button for social campaigning. Curious about how to hit your own turbo button? Let’s talk about your issue based publication.